With only 12 days left to get yourself the lowest prices ANYWHERE on KitchenAid Stand Mixers, we thought it would a great time to talk attachments. After all, your mixer does a lot more than mix… Unscrew the cap on your mixer’s Power Hub and open a world of endless possibilities. This versatile hub works with all KitchenAid attachments to inspire creativity around every recipe.With more than 12 Stand Mixer attachments, you can make anything you put your mind to—pasta, sausage, salsa, sorbet and so much more. Check back everyday to see all twelve! Two chrome-plated metal pasta cutters each use the power of your KitchenAid® Stand Mixer to quickly turn out beautiful batches of homemade pasta. This set includes the lasagnette cutter for thick fettuccine or egg noodles and the capellini cutter for spaghetti and angel hair pastas. 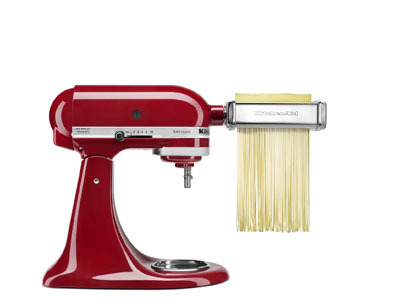 Recommended for use with the KitchenAid® Pasta Roller attachment.